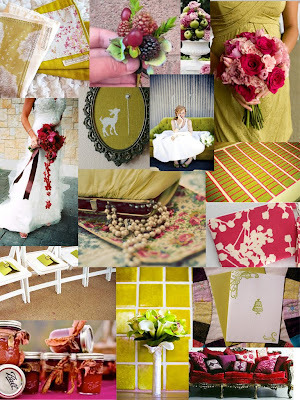 Todays color day celebrates summer with bright and fun chartreuse and romantic raspberry red. "What the heck is chartreuse", you ask? Well, it's a fancy little name for "yellow-green". Not quite lime but not quite yellow, this in between shade is unique and not usually found in most weddings or general decor/wardrobes. Most people feel this color is too bold but we'd have to disagree! This hue can easily be toned down with neutrals like taupe or white. We suggest using this retro color in small doses and accenting it with the fresh and feminine shade of raspberry red for a cutting edge, modern, color combo for summer. Renegade Craft Fair - Top 10 Finds!